We accept applications for internships year-round. Once the position becomes available, you will be contacted if your skill set and experience match the position’s requirements. Accounting Intern – NEW – assist the Finance team with bookkeeping and accounting functions such as accounts receivable, accounts payable, finance reporting and analysis, and donor acknowledgement communications. Graphic Design Intern – NEW – assist the affiliate with various design needs for special events such as the Race for the Cure and overall affiliate marketing and messaging. 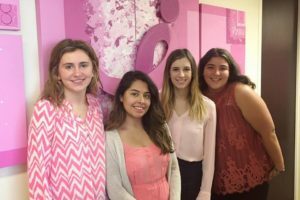 Development Intern – assist the Development team with fundraisers; Annual Gala, Ride for the Cure, First Look for Charity. Special Events Intern – NEW – assist the Development team with special events such as Race for the Cure, Ride for the Cure, and Annual Gala. Intern will assist with partnership solicitation, database management, mailings and general donor communications. Social Media Intern – assist the Affiliate with social media including e-newsletter campaigns, Facebook, Twitter, website and other digital media. Community Health Intern – NEW – assist the Mission team with program coordination and community engagement for our signature educational program called Key 2 Life, along with supporting outreach and dissemination of breast health information at health fairs across the five-county service area. Volunteer Programs Intern – assist with recruiting, orienting, training, managing, supporting, and retaining various Komen volunteers; intern will assist with recruiting and deploying 200+ volunteers on Race Day.